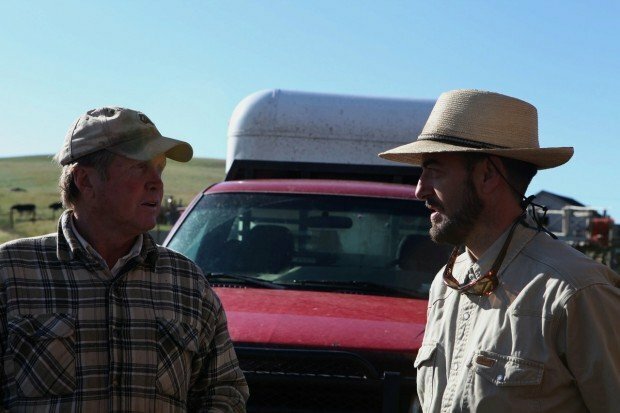 Bighole Valley Rancher Blake Huntley, left, talks with Steve Primm, a member of People and Carnivores, about the new “coexistence” project funded in part by the Wildlife Conservation Society. 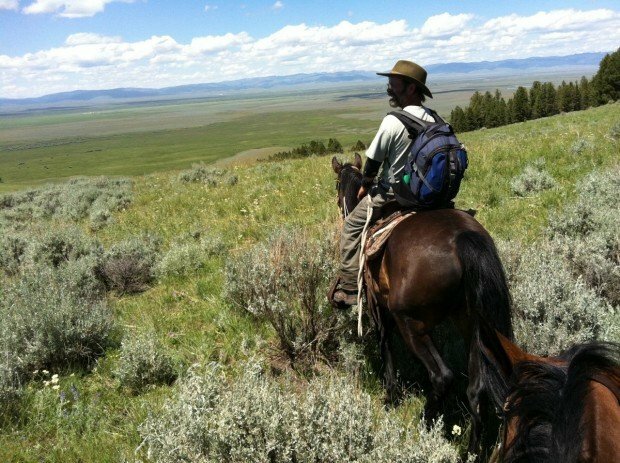 Chet Robertson, a range rider in the Big Hole Valley, keeps an eye on the cattle and an ear out for wolves. But over the past year, Rosen and a team of Big Hole Valley ranchers have formed an unlikely alliance, joining forces to test nonlethal methods of keeping wolves and cattle apart. If the efforts pan out, the project could be continued in other areas of the Northern Rockies and the Greater Yellowstone Ecosystem, where people and wolves now coexist. "Over time, the ranchers I've been working with have started trusting us," said Rosen, a field scientist with the Wildlife Conservation Society. "When working on wolf or bear conservation, you realize you need to engage with people and respect them." Before the project began this spring, 67 wolves had been lethally removed from the Big Hole Valley since 2009. Hoping to reduce those numbers, the Wildlife Conservation Society formed an alliance with three Big Hole Valley ranchers, along with the Big Hole Watershed Committee and Montana Fish, Wildlife and Parks, among other agencies. "We didn't propose our ideas as silver bullets," said Rosen. "Wolves are very smart animals. There's only so much you can do to reduce the conflicts. You'll never completely eliminate it, but we believe we can help minimize it." Participants in the "Coexistence Project" have experimented with several nonlethal deterrents over the past year, including the use of fladry, or flagging, which has shown some success in keeping wolves at bay. They've also experimented with electrified versions of fladry, along with a range rider -- a backcountry horseman who helps keep an eye on the cattle much as a shepherd does with a flock of sheep. Blake Huntley, a Big Hole Valley rancher, joined the project earlier this year. He was eager to see if the methods could work to reduce the depredation of his cattle. So far, he said, the jury's still out, though he remains optimistic. "The fact of the matter is, these darned wolves are pretty unpredictable," he said. "I don't think I have enough experience under my belt yet to say if the experiment is working or not." If recent years are any measure, Huntley said, area wolf packs typically disappear after June. Past and current summers have been quiet, just the way Huntley likes it. The range rider didn't report much howling and no cattle have been killed. But then, as in years past, the wolves returned this September. That leaves Huntley uncertain whether the efforts are working, and whether he can spare the personnel to continue the project when the Wildlife Conservation Society leaves. "Their acts of aggression are so random and their movement is so large, you might not think there's any wolves present, and all of a sudden, they're there," Huntley said. "From my viewpoint, at this point in time, I don't know if the range rider is a plus or not." By 1900, wolves in the West had been hunted almost to extinction. Ranches evolved in the Northern Rockies without the presence of the wolf. But since their reintroduction to Yellowstone National Park in the mid-1990s, wolves have returned to their historic range across parts of Montana, Wyoming and Idaho. Some have hailed the animal's presence, calling it a powerful symbol of America's wild places. Others have been slow to accept their return. "It has definitely changed the landscape," said Nathan Lance, wolf management specialist with Montana Fish, Wildlife and Parks. "The simple solution is that either the carnivore leaves or the livestock leaves. But that's not where we are and it's not where any of us wants to be. It's about stopping the losses and minimizing the risks." Lance said the project has enjoyed its share of success, including its ability to bring groups together in search of a common solution to a longstanding problem. The range rider project also has shown positive signs, not only because it keeps a watch out for carnivores, he said, but because it keeps an eye on the cattle. In years past, Lance said, when cattle returned home for the season and ranchers wound up one or two cows short, wolves more often than not got the blame. But the range rider is able to alert ranchers to sick cattle and cows that have died. By working with watering sources, the rider also has lent a hand in range management, something Lance is pleased to see. "It all boils down to how a rancher or an interest group wants to define something," Lance said. "If this goes two months and you don't have any losses, and then you have a calf killed, how do you define that? Is it still a success? There's no major cure-all, no 100 percent stopping it." Other states, including Idaho, have used range riders and fladry to help keep wolves and cattle apart. Minnesota and Wisconsin have also employed proactive methods to reduce conflicts. Lance said there's no reason Montana and Wyoming couldn't do the same. He'd like to see the project move into a second year, revealing trends while giving those involved a better understanding of what works and what doesn't. "Some of it is community acceptance toward new kinds of practices," said Lance. "We'll have to soul search and define what we deem success. I think a second year would really help. It'll start giving you that trend." Though skeptical, Huntley isn't dismissing the efforts just yet. He's looking to work with state and federal agencies charged with managing wolves, along with the conservation groups hoping to reduce their conflicts with cattle. "You're better off trying to work with them than turning your nose and saying no," Huntley said. "Our goals are somewhat different, but at the end of the day, if the wolves aren't eating my cows, that's good with me and it's good with them, too."